1. Transport: CD player or analog turntable. 3. Vinyl disc or CD. 5. Preamplifiers and integrated amplifiers. We have said that as we improve the sound of our system, reaching more and more refined and natural reproduction levels, all of the above factors are of paramount importance, for they each take on an equivalent weight of around 10% of the total sound quality. That is, if all these factors are optimized, they will each take on the same degree of importance regarding their action over sound reproduction, for they will have the same weight of influence over the final results. When considering the “room” factor, we have said that whenever we refer to an “ideal” reproduction room we report ourselves to a listening room devoid of reflections or other aural interferences. In such a place, only the sound emanating straight from the loudspeakers reaches the listener. In order to eliminate the possibility of existing reflective surfaces, the “ideal room” would be the one presenting the largest possible height, width and length dimensions. Taken to its ultimate consequences, such a concept culminates in the set up of something utopian – a room whose dimensions would be so large that its surfaces would be placed extremely away from each other, in the “infinite”. The “ideal room”, therefore, would hypothetically be the open space itself (lacking any reflective walls). For the time being, however, and coming to “place our feet on firm ground” again, we observe that our rooms are quite far from the ideal room. The fact is that the smaller our room’s volume is, the greater the negative influence that its surfaces cause upon the sound will be. And the room’s relevance will no longer be 10% (as in the ideal case) but will range from 50 to 70%, with respect to the final result, regardless either of its possessing the so-called “golden dimensions” recommended by the acoustics or of its containing first rate equipment. Therefore, the room becomes the most important factor, acting directly upon the final sound results of a sound system. In our last article we had stated that in a room of small cubic volume, more than half of the success attributable to good sound reproduction comes from the acoustic treatment applied to it. But what should we do to make our room better? In this field, opinions greatly diverge and there is no consensus, not even among acoustic professionals. This is because acoustics is one of the most complex realms of physics and few know it in some depth. Speaking for myself, it took me years to realize this aspect. I would endlessly replace equipment, tinkering with the electronics, but I couldn’t come to the full results I had been hoping for and feeling a little frustrated along the way for not having obtained the satisfaction of reaching that ideal reproduction I sought so much. I had graduated in electronic engineering, but the knowledge of acoustics I acquired at college was quite poor. Since then, I have been learning about this subject from what I've read. More recently, I have dedicated myself to seek more information. When you start to look for information on how to treat your room, you face such an amazing array of treatment theories! Some say you must “foam up” the whole room, and these people guarantee this solves the situation. Others disagree and say that the room becomes too “dead” this way, and state that a room should be neither “live” nor “dead”, but “semi-live”. Still others prefer the solution suggested by Mr. Arthur Noxon and end up placing tubes everywhere, the so-called “Tube-Traps”. There are those who try to treat all surfaces with special fittings, in an attempt to avoid any type of reflection. And there are those who believe that random reflections are the ones that indeed help make sound reproduction better, and so place the largest possible number of objects inside the room, in order to create countless reflective surfaces ! And so it goes on.. Doesn’t it seem very contradictory to you? What now? Which position should we adopt? Where is the common sense? Which one makes the best cost/compromise ratio? We will certainly need a very critical analysis in order to act properly. It is clear that amid this confusion you will need a good acoustics advisor to help you out ! What to do? Where to begin? Let us try to clear up these ideas. It seems logical and of good sense that we should try to come closest to the ideal situation. We have seen that in an ideal room, only the sound emanating from the loudspeakers reaches the listener. Therefore, our procedure should be one that tries to guarantee that just the sound emitted by the loudspeakers reaches the listener. This also means that we should act in such a way as to eliminate or avoid any kind of sound reflections or sound interferences that reach the listener and blemish the sound emitted by the loudspeakers. In fact, reflections are the greatest villains in any room; the enemies of good listening. They are the origin of the sound quality degradation we hear, for they get mingled with the sound coming straight from the loudspeakers and end up distorting the recorded image we are trying to reproduce. Reflections alter sound perception in the deepest way. What steps, therefore, should we take ? First, I want to suggest to you a simple operation: take out everything that is not essential to the room. Take out the piece of furniture that is purely decorative, take out the aquarium, if there is any and take out any superfluous objects. Of course I do not propose here that you get into an argument with your wife, but may be you will skillfully reach an agreement by explaining the reasons for this procedure. We have already seen that the greater our room’s free volume, the better the sound results of our reproduction will be. Hence, we must not place any additional object there, because besides diminishing free volume, we will be creating new reflective surfaces. Dealing with wall, ceiling and floor reflections will already be a challenge in itself, and just imagine if we create new surfaces on each corner which, small as they may be, will reflect sound in a disorderly way ! Then, instead of solving our problem, we will in fact be creating a bigger problem ! Of course the greater the number of random reflections we have, the less our control will be over the room’s acoustics ! It would be ideal if our rooms were only used for listening, isn’t it? Try this experiment though. Perhaps you may perform it on a calm Sunday evening. Take out of the room everything possible and check how the sound changes. Experiment ! Check out the soundstage ! This is a very interesting experience indeed. And besides, it is much easier to treat acoustically an empty room than one full of things. A second step to be taken would be to define and delimit in our room a given zone or specific listening area. Where are the listeners going to sit ? Our goal here will be to analyze only those reflections that could reach the listeners. By doing this we will also be simplifying our problem, besides limiting our procedure only for what we really want: to guarantee purity of sound for the listener. Fig. 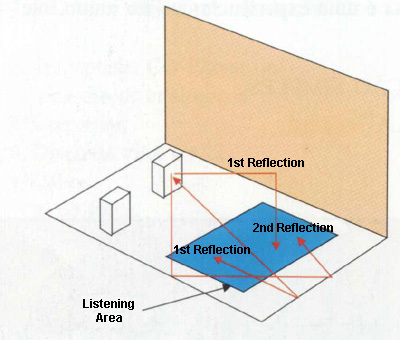 01 – Definition of listening area for studying the reflections reaching the listeners. If we were dealing with a recording studio for example, our analysis would have to be different from the one we will use here. For us, the important thing is that the listener is reached mainly by the sound that emanates directly from the loudspeakers. However, reflections come to join the direct sound, obviously at a time lag with respect to the direct wave, since they have to cross a larger distance before reaching the listener. First reflections reach the listener soon after he or she has captured the sound that comes straight from the loudspeakers and then, the second reflections reach this listener a little later, and so it continues. Do you know how we process all this battering of sounds ? Our ears make a psycho-acoustic analysis of everything that reaches us. In order to identify and take in what we have captured, our ears mix and integrate into one whole chunk all the sounds that are similar between themselves, even if they have been captured at a spacing of up to some tenths of a millisecond. In other words, our ears join and integrate similar sounds, even if they have occurred at differences of up to some tenths of a millisecond, and consider them as if they had occurred in one instant. I would like you to ponder a little about this, so that you can understand what I am trying to show you, for it is something quite serious for the results in sound ! Realize that direct sound mingles with this same sound’s first reflection (whose intensity is a little less than the one from the direct sound)…..and our ears consider this as just one event! It’s no surprise that without acoustic treatment our system’s sound quality does not seem to be among the best around, even if the equipment is first rate ! And many times we don’t understand why the soundstage does not show up, or why the sound seems flattened in but one plane, if we have been investing so much in our system ! But the truth is that the soundstage can only exist if the sound that comes directly from the loudspeakers dominates all the other sounds. First reflections are the ones most damaging to the sound and must be acoustically treated. For example, the first reflections taking place in front of and behind the loudspeakers affect soundstage formation on reproducing sound. On the other hand, first lateral reflections are responsible for impairing texture and tonal balance. Another important aspect that happens to our psycho-acoustic perception is the fact that the second and third reflections reach our ears at times longer than some tens of milliseconds, and present themselves in much lower intensities than the ones coming from the direct sound. These are less relevant and are not being considered by us, for we cannot identify them nor understand them. In fact, they are “echoes” from the notes being played that remain under reverberation in the room. So much so that acoustics names this phenomenon “reverberating field”. The consequences of this for the results of sound are quite disastrous, since sound intelligibility is quite affected, that is, notes lose their sharpness. This problem becomes more emphasized in larger rooms. The smaller the room, the lower the influence from this phenomenon. According to the room’s dimensions, other kinds of problems may occur, such as the appearance of reflections at low frequencies (in the range from 60 to 100Hz). These influence bass intelligibility. To the listener, when this happens, the bass sounds resonant and “one-note-only”. This is a problem that is difficult to solve. To summerize, on sound reproduction, reflections are the greatest villains, and specifically first reflections, when it comes to small listening rooms such as ours. Initially it is necessary that you determine the position of your loudspeakers in a definitive way. In order to help you on this task you may refer to a very known website, the one from George Cardas, who is a sound cables specialist. In this article he provides some parameters for positioning loudspeakers in a room with “golden dimensions”. If memory does not deceive me here, our dear Holbein Menezes has already commented on this site on one of the articles of our then “Audio Club” (Clube do Áudio) magazine, having published on that occasion the main figures and directions presented by Mr. Cardas. Only after having positioned the loudspeakers you will be able to define and delimit the room’s listening area, where listeners will be sitting. Only after this will it be possible to discover, for each wall, the region where first reflections will be taking place, the ones that reach the listening area. These are the zones that must receive proper acoustic treatment. Since the set of problems for each place is unique, due to countless variations such as each room’s dimensions, free volume, reflective surfaces, and aspects such as whether the room is solely destined for listening or not, etc., I recommend that you consult an engineer expert in acoustics. As you see, there doesn’t exist a unique, standardized solution that is satisfactory for every listening room. However, there are those who venture themselves in providing standardized “solutions” – American magazine “Sound Advisor”, for example, presents some kits for the acoustic treatment of first reflections, that, from what I could check, are not always the most suitable ones, and are also very expensive. We are now going to refer to that question raised in the previous article: "Have you by any chance discovered which factor most influences sound results, second to the “room” factor, the one we have just seen? What is your opinion?" Cheers to all, and…..good listening!